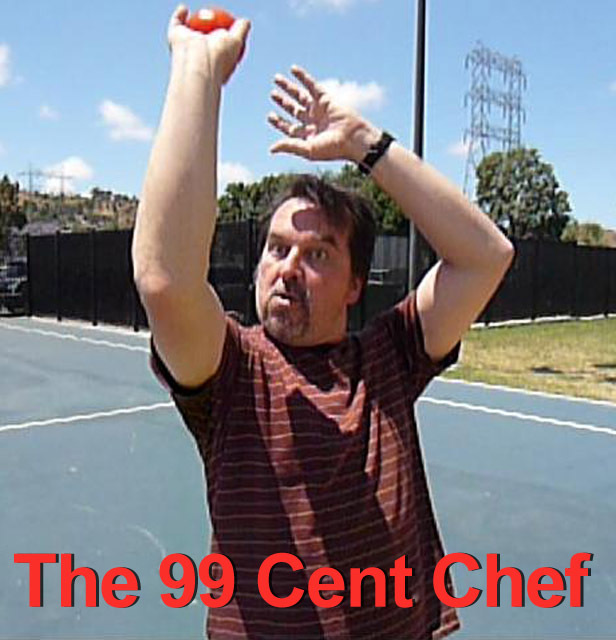 Welcome to the NBA playoffs, 99 Cent Chef-style, that is. This is basketball played by the rulebook of the Cheap$kate Dribblier. The matchup this year is between the Golden State Warriors and the Cleveland Cavaliers. Great NBA All-Star match-ups have included Magic and Bird, Kobe and LeBron...and now: Pete vs. The 99 Cent Chef! It's a triple-double of a basketball video event. One-on-one has never been so much fun. Like in my baseball video from years before, playing with food is taken to surreal and fanciful extremes. What starts out as a simple 5 basket pickup game turns into a food free-for-all, and you can be sure things go splat when there is a drive to the hoop. As you enjoy and cheer on your team, see if you can see some of classic basketball moves I've adapted into the video at the end of this post. First up is the Bell Pepper Bank Shot: a shot that hits the backboard before hitting the rim or going through the net. Banana Cut: a wide, curving cut, as opposed to a cut that is a straight line. Also known as a 'C' cut. Onion Over the Back: a foul committed by a player who tries to rebound the onion by pushing, moving or climbing on a player's back who is already in position to rebound the ball. Apple Advance Step: a step in which the defender's lead foot steps toward their man and the back foot slides forward. Cucumber Chucker: a player who takes frequent, and often imprudent, shot attempts. The term was popularized by the television series Seinfeld. Toilet Bowl Tomato: when the ball hits the rim at a certain angle and then circles around it, can go in or out. During this week of the NBA playoffs, be a sport and join me for his outlandish halftime entertainment event. Play it here. The video runs 4 minutes, 47 seconds. 99 thanks to neighbor Pete for a slam-dunkin' performance! And extra thanks to my fellow Culver City art gallery hopping buddy Bob McGinness for additional creative camerawork.